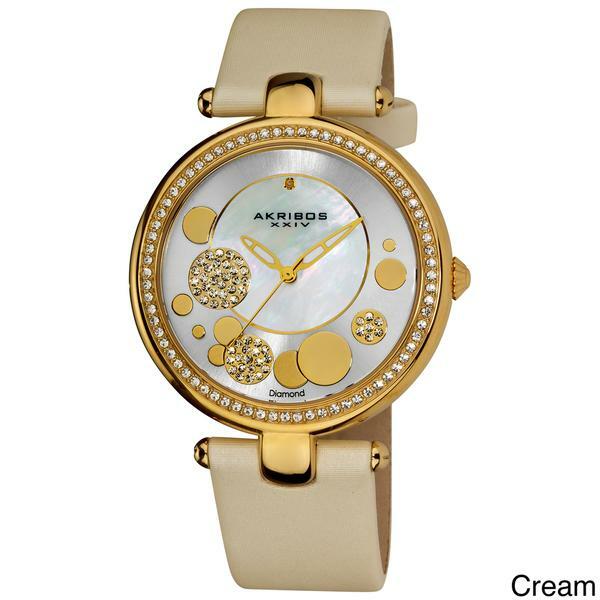 Add some sparkle to your wardrobe with this charming watch from Akribos. This timepiece from Akribos XXIV showcases a silver sunray dial with a mother of pearl center and genuine diamond accents. A white satin strap completes the classy look of this women's watch. Payment must be received within 5 business days after order is confirmed. Please contact us immediately if you need special arrangements. After 3 days we reserve the right to cancel the order or relist the watch. NYS buyers will be charged 8.875% sales tax. We accept PayPal, Visa, Mastercard and American Express. For PayPal payment shipment will sent to the confirmed address on your paypal account only. Shipping is Free for all orders, within the USA. Your order will shipped via USPS Priority Mail within 24-48 Hours of payment receipt. Priority Mail is not guaranteed but usually arrives within 2-4 business days. In the event you need your order quicker, please email us right away. We can ship via UPS overnight, 2nd day or other guaranteed method for an additional fee depending on your location. We very often send our packages with a signature requirement for your benefit, to avoid delivery problems. If this is a problem, or there is no one available at the confirmed address during daytime hours please let us know right away as we do try to ship as soon as possible. We do not offer any return Policy. Please make sure this is the item you want before you Purchase it. In case of approved returns, unless there was a problem with the product, please be aware that shipping charges CANNOT be refunded. In addition return shipping is also the responsibility of the customer. Please check with your country's customs office to determine what these additional costs will be prior to bidding/buying. These charges are normally collected by the delivering freight (shipping) company or when you pick the item up do not confuse them for additional shipping charges. Your satisfaction is very important to us. We will accept returns on NEW PRODUCTS ONLY, no questions asked, within 30 days of item receipt, please email us with your order number and the item number you would like to return. Please note that the item must be returned in the original packaging with all original papers, warranty card and plastic coverings. Please do not remove the covering if you do not intend to keep the watch. IMPORTANT: Any signs of wear will invalidate the return. Please check the item when you receive it to make sure there are no problems. Once the watch has been used, the tags have been removed, or the watch has been re-sized or tampered with in any way we will not accept the return. We sell genuine watches only and all come with a valid company warranty. If your watch is not BRAND NEW all problems will have to go through the warranty. Yourdreamizhere is a small family owned and operated business located in NYC - The Jewelry Capital of the World. Jewelry and Watch purchasers have traditionally had two options, buy brand name products, with high price tags, paying for the name and fame of others in order to receive good merchandise or get cheap imitations of inferior quality. We opened your dreamizhere.com in 1999 to fill a niche in the jewelry and watch world for ordinary people like ourselves who would like to be able to purchase high quality jewelry and watches at affordable prices. We have one goal only and that is a happy customer, and we have reached that goal countless times. Customer Service is our #1 Priority. We have kept our business small, and in the family so that anyone you talk to can handle your problem from start to finish. No more waiting months for a reply or being sent from person to person. The person who gets your email or phone call will address your problem and make sure you are totally satisfied. We take pride in our large amount of repeat customers and customer referrals and invite you to join our happy family. Please feel free to contact us. We respond to all email as soon as possible, however, please be patient during weekends and holidays.